A scarf-wearing cat got stuck in the engine of a parked pickup truck Tuesday, testing the limits of both contortion and cuteness. 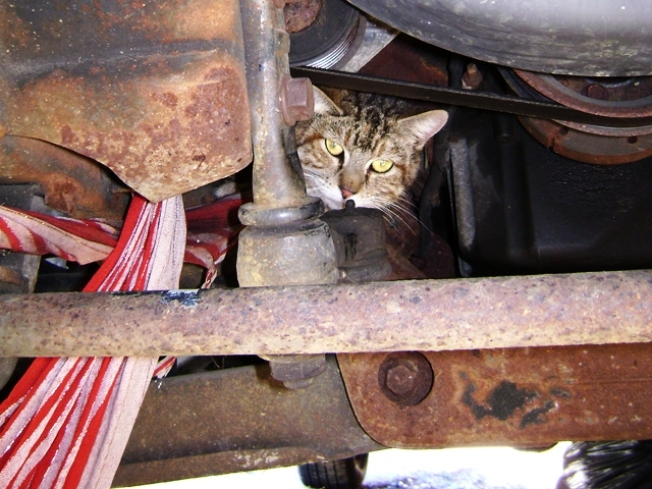 "We have no idea how she got the scarf," says a blog post from the Washington Humane Society, "but... the cat's scarf got tangled around part of the front axle and the feline was trapped." Fortunately, an animal control officer cut the scarf and freed the dapper kitty, who wasn't hurt. The cat is now being evaluated for adoption at the New York Avenue shelter. We hope it will find a family who is willing to share their accessories.